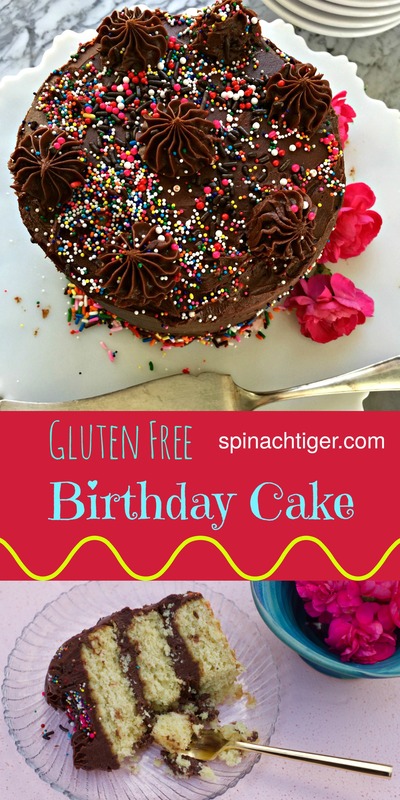 This is the cake known as birthday cake, and it’s gluten free. I don’t know why this has become the “birthday cake.” It’s yellow inside, chocolate outside and it has sprinkles. It’s the cake my husband had for every birthday. I wonder how this got started because I never had this growing up. I always assumed a proper birthday cake was this chocolate with chocolate fudge frosting. If you know anything about the history of “birthday” cake, let me know! The Best Gluten Free Yellow Cake! There is a secret ingredient in this gluten free yellow cake that makes this taste just like yellow cake. It wasn’t my idea. I got this recipe from America’s Test Kitchen. I tweaked it only slightly, because while everyone loved their version, it was a smidge too dry for me. I substituted half of the butter for oil and that made it perfection! This is a delicious birthday cake that brings back lots of memories for the men in my life. It seems this is the cake their mother’s made for them. No one complained that this is gluten free made from scratch! You could make this cake as two large 9″inch layers, 24 cupcakes, or do what I like to do, the triple layer tiny cake, baked in three 6-inch baking pans. White chocolate is one of the secrets for the gluten free yellow cake. Get the best white chocolate you can find. It adds in fat and a bit of flavor. This is a gentle reminder that baking can be tricky. Get all of your ingredients out and measured before you begin. I accidentally wasted four eggs the other day not listening to my own advice. Weigh your flour. It matters. Once you get the knack of using a kitchen scale to weigh in grams, you’ll be more assured of a good turn-out. If you’re new to baking, there’s a simple reason. A cup of flour can vary from a cup to a cup and a half, depending on who packed it. A cup of flour packed too tightly is going to be dried baked good. Weigh your batter. I like to bake in three 6-inch cake pans. I find the outcome to be more dramatic. The only thing that can get in the way of its looks is uneven layers. I weigh my batter and divide by three, using the scale. Simply weigh the batter. Divide by three. Zero or (or tare) each pan and add that amount. You will be so happy that you took the time to do this. Make your cake beautiful. 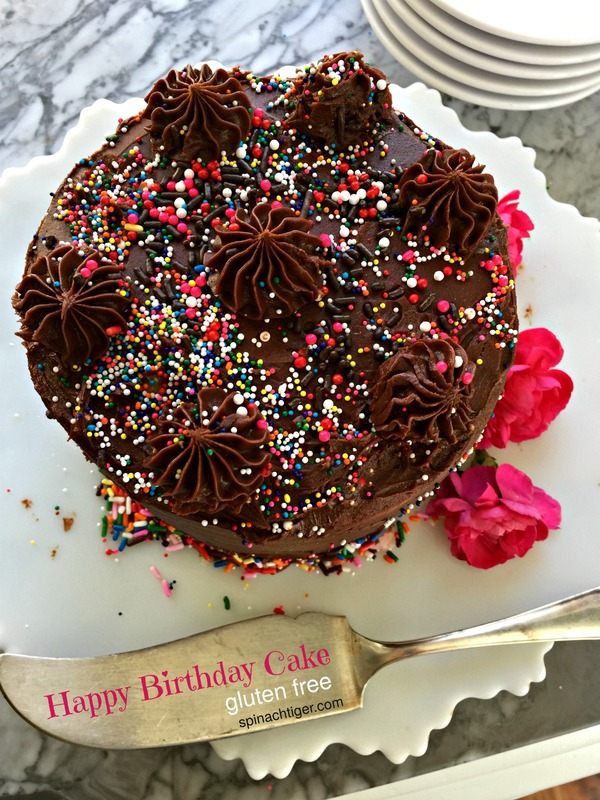 Sprinkles and few magic tricks with this decorating tool (so easy, a child can help you), will turn an ordinary cake into something quite special. Let’s face it, cakes are work. There are a lot of dishes, spoons and equipment to clean up. All that works deserves applause and sprinkles, as child-like as they are always yield a smile. Use two kinds of fat. Use half oil and half butter, as butter is typical for yellow cake, but not easily absorbed when using gluten free flours. To sub butter, 2 tablespoons of butter equals 1 1/2 tablespoons of oil. In this case I cut out four tablespoons of butter and replaced it with 3 tablespoons of avocado oil. I made a milk chocolate buttercream, and used this Oxo Decorating Tool Kit to add a few simple swirls. This is better than using pastry bags. It’s reusable and easy to clean and control. 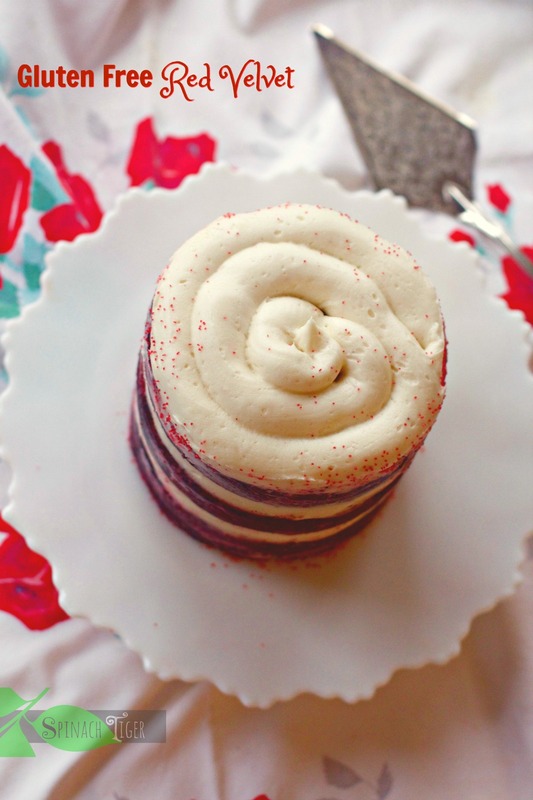 Usually when I do small triple layer cake, I make a naked caked, like this gluten free red velvet cake. But a birthday cake gets all the frosting all over and sprinkles on top. Make sure to completely cool the cake and refrigerate before applying a crumb coat. This means you will layer your cake (after leveling each layer) and put a very thing over all frosting coat. Then refrigerate for 30 minutes and finish the frosting. Apply the sprinkles immediately. I then move this cake to the refrigerator and take out about an hour before serving. Gluten Free Yellow Birthday Cake, moist delicious with a chocolate frosting. Line with parchment paper and grease parchment paper. Put white chocolate, butter, oil in double boiler (or use a stainless bowl over saucepan of simmering water). Stir until melted. Set aside to cool. Sift flour, salt, baking powder, baking soda, xanthum gum. Set aside. Whip egg whites with cream of tarter on medium low speed until frothy. Add ½ cup of sugar and whip until you have stiff peaks. Transfer the egg whites to a cold clean bowl. Clean mixer and add egg yolks and vanilla until well blended. Add remaining sugar. Mix well. Add chocolate and sour cream mixture to egg yolk mixture. Turn mixer to low; add flour mixture and blend until completely combined. Add egg whites, using a rubber spatula and fold in. Divide cake pan evenly. I weigh my batter between pans. Bake until cake pans pull away from pan. If using 6 inch pans, bake for 25 to 30 minutes. If using 9 inch, bake 30 to 32 minutes. Sift cocoa powder. Sift confectioner's sugar. Add cocoa powder, salt, and sugar together. Mix well. Add to butter a cup at a time on medium speed. Add heavy cream, a little at a time. You can make frosting two days in advance and refrigerate. Or, you can make and freeze until needed. Add sprinkles as soon as the frosting is finished. If you use Bob's Red Mill one to one gluten free flour, add ½ teaspoon xanthum gum. Looking Yummy! Thanks for sharing this cake recipe and i will surely try to make this recipe at my Home for my darling husband. according to america’s test kitchen (who she altered the recipe from) the answer is 4 large eggs, separated. What a cute cake!! I’m sure all of the people who are gluten intolerant will give you a big kiss. Nothing like being able to eat a delicious cake on your birthday!! Hope your fall is going well. Thanks Marissa. Even those who don’t need to eat gluten free are loving my baking. Makes me happy!